Imitating Hogan's swing is possibly the most difficult way to discover Hogan's Secret. Why? Because Hogan's implementation of the Secret was designed to achieve precisely that. The Secret is simple but it is hidden behind a cleverly crafted smokescreen. Ben Hogan was not only a Master of the Golf Swing, he was a Master of Camouflage too. Hogan chose to play the Pied Piper in Five Lessons. He did not give away the Secret outright but placed ingenious clues throughout the book. Outside of it, he made statements that were either cryptic or had a double meaning or were contradictory in nature. I like to use the word Hoganism to represent one or more such statements. Hogan actively deflected attention from the Big Picture of the Secret by highlighting a minor or trivial aspect. 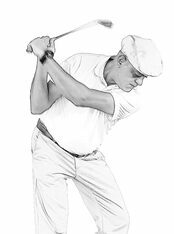 For example in the famous 1955 Life magazine article, Hogan revealed that the Secret had to do with three changes he made – a cupped left wrist at the top, a weakened left hand grip and an old Scottish technique called pronation. Professionals and people in the know - but not the public at large - caught on that this was a Hoganism, a smokescreen. What Hogan did reveal were the actual changes he had to make to implement the Secret, but not the Secret itself. In other words, he revealed the effect, but not the cause. In fact, Mr. Hogan never lied about the Secret. He was too conscientious a man to do that. Mr. Hogan just did not disclose the Big Picture of the Secret. Most people would agree that Mr. Hogan owed that full disclosure to nobody. To be fair to the Master, we have to understand the context of Hogan’s Secret. It was the culmination of 23 years of experimentation with the golf swing. Hogan was the quintessential tinkerer - he loved to try out new things. He spent entire days on the Practice Range, discovering what worked and what did not, refining what worked and abandoning what didn’t. He literally dug his Secret out of the dirt. While he was still playing on the Tour, he did not want to give away his hard-earned competitive edge to his rivals. In fact he took active steps to disguise it. But after his retirement, Hogan was again reluctant to give away the Secret on a platter. In response to the direct solicitation, he famously replied that the Secret was in the Dirt. That, as we shall discover, is a Hoganism. 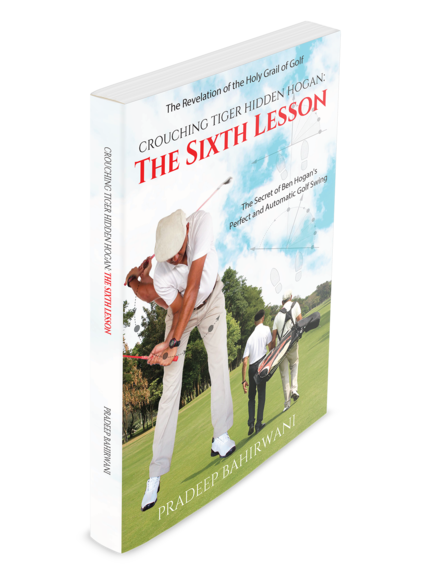 The first and obvious meaning of the statement was that he wanted golfers to practice the lessons he taught in Five Lessons and discover the missing elements through hard work , just as he had done. The second and not so obvious meaning, was his outstanding use of ground leverage. Hogan urges us to hit as hard as we can with the right hand. He then says that is only half the story, that we must hit as hard with the left hand as with the right. But he goes further to remark that as far as application of power was concerned he wished he had three right hands. So why not three left hands as well? In fact, Hogan said elsewhere that he wished he had half a left arm. And yet, when you see the Big Picture of Hogan's Secret, these statements will make perfect visual and precise logical sense. You too will be enthralled by the genius of the Master. Hogan was brilliant, introverted and left-brained. Did you know that Hogan's IQ has been estimated at 175, a full fifteen points above the genius level of 160? What do you think such a professional golfer would come up with when faced with a survival issue - a repeatable way to hit a golf ball long and straight? BX: The second clue is also on page 42. It is not obvious. But it becomes clear if you get the first clue right, because the two are a pair. © 2015-17 Pradeep Bahirwani. All rights reserved. The content on this website or any portion thereof may not be reproduced or used in any manner without the express written permission of the copyright owner. For specific queries, please email author@crouchingtigerhiddenhogan.com. Images of the book on this website are creative renditions and may vary slightly from the actual product (5.5'x8.5",126 pages, paperback). More detailed information about the Author is available at LinkedIn.